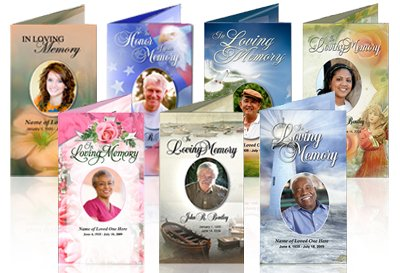 Memorial Program templates are pre-designed cards that sent to people as invitation for the funeral event, life celebration event or memorial event of someone’s life. People buy these cards, and fill it with the details of the event, and post or send them to those, who they want to attend the ceremony. When there is an upcoming family event, there are a lot of things that require your attention, but it at times becomes a mess when you try to handle everything at a single moment. You alone can not take load of every responsibility. There already are so many headaches to take. Memorial program template is a constructive and convenient way to deal with things stress and anxiety, occurred due to responsibilities on your shoulder. Funeral or memorial event are called upon when one of the members of your family departs to god’s world, and you have to pay tribute to him or her, at his or her funeral or memorial program at the church. It is such a time when people do not feel comfortable in talking properly, how would anyone be able to arrange for an entire event? It is next to impossible to take care of every single thing after the sudden departure of one of your loved ones. And what to ask for purchasing the memorial card, and filling it with details, recalling the names of attendees and mourners, and sending them the invitation card to call them up for the memorial event? 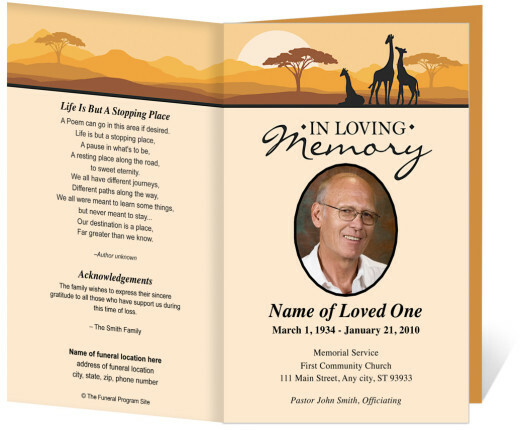 A memorial program template is a sample invitation card, which has already been designed to help people inviting their guests (mourners) at the funeral event of their family member, who passed away due to the God’s Law. As they are already designed, they offer a great deal of convenience. They take a very little time. You can customize them right away, without wasting much of your time. The templates, nowadays, are available in digital format. One can purchase them from an online store, and print them, after customizing them as invitation cards. They are available in an array of designs to choose from. One can easily find a unique and decent looking memorial program template card. Apart from online websites, these sample cards can also be found in MS Word, the most commonly used office application. The templates available in MS Office suite are wide used across the globe. And this is what the major drawback of using free template is. They have been used so many times, and they do not offer freshness in their design. You might have seen so many memorial cards that were created using Microsoft’s free templates. No one would love to send a bad impression by sending an over-distributed card. Where to Buy Memorial Card Template? From online design studios! Yes, you can choose to buy memorial program template from a website. There are generally two places on the internet where you can buy them – either from a designer’s blog or website or from a dedicated design studio. Both are same, and have unique and elegant card samples for you. These websites showcase their newly designed card templates. They display them in high resolution images. You can view as many cards as you want, there will be no charge for that. You can see their inner pages, color options available, other details, before judging which card sample you actually have to buy. Some of the websites are so interactively designed and developed. They let you fill up your details and customize your card; you can personalize your card, and once done, you can download the card by paying for the template. After downloading your readied card, you can take the print out, and ship them to the attendees of the program. The free templates, on the other hand, can only be customized in document editing software applications, like Ms Word, Open Office Editor, PageMaker, etc. Though you can add cover, texts, etc. in free templates as well, but only in limitations. Additionally, they require a great amount of your time to design and customize a suitable memorial program card. Deciding to make your specific memorial program template on website would be an astute choice. Though you have to pay for the template, but you are getting a uniquely designed, decent looking memorial card, in a short span of time. It saves your precious time, and becomes a less mess than customizing the card on MS Word or visiting your local card shop. You can use your saved time in other activities, as arranging the meal or drinks for the guests at the ceremony, and doing the price negotiations with the florist to take care of the decorations at the venue.